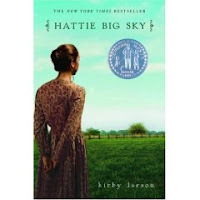 Hattie Big Sky by Kirby Larson. Copy from author. Cybils short list 2006. Newbery Honor. My Best Books For 2006 (sidebar). The Plot: It's 1918; Hattie Brooks is 16; she's an orphan, shuttled from relative to relative. When she finds out that an uncle she didn't know about has died and left her his homestead claim in Montana, she resolves to go, prove the claim, and create a home for herself. The Good: I adored Hattie Big Sky. And at this point, I do think I am officially the last blogger to review it. When I read this back in the fall, I immediately wanted to pass it along to everyone -- not only does this work for teens, but for younger kids reading up and for adults. One of the ladies I work with came into the library raving about it, saying how it's the first time in a long time she stayed up late reading, and crying. And refused to believe it's a teen book, much less a kids book. And that shows just how amazing a title this is -- that it can work for multiple readers. I imagine sixth graders reading this, then rereading it ten years later and marveling at the things they didn't pick up on earlier. There is nothing objectionable for younger readers; yet at the same time, there is a lot going on, from politics to depth of character to motivation, that is best appreciated by older readers. Hattie is alone in her struggle, alone as she has been all her life. Except she's not. She has neighbors who become friends; including a warm, loving German family. Remember the year. World War I is raging, sons have left to fight in the war, sacrifices are being made for the war effort, and a family that speaks German is not popular, to say the least. But this family reaches out to Hattie, and she discovers that family can be people who are not bound to you by blood. I love the details -- we know exactly how much Hattie has in the bank, how much things cost, we add and subtract and hold our breath, hoping it will work out. $400 is a lot of money -- will it be enough? How can a teenage girl earn more? The language is wonderful: "The stew tasted of sage and carrots and hope." Now for some spoiler stuff. 1918 is also the year of the Influenza Epidemic. So the flu visits Hattie and her friends. And yes -- there is a death. I cried, hating the death. But the death had to happen. One of my great grandmother's sons died from the flu; she was pregnant with her last child and just buried her husband. Death happens, it's not fair, and it would have been a lie not to have a death. But man, it tore my heart out. The ending was note perfect: Hattie starts out wanting to create a home by proving up her claim. She sacrifices, counts pennies, learns to build fences and plant. And at the end of the book, she has create a "home", a sense of belonging -- but not in the way she thought. And some more spoiler stuff. You see, Hattie doesn't prove her claim up. Not only that; she ends up in debt. But Hattie has hope; and while some people mock books that end with hope, I love hope that is realistic and earned. Hattie has a sense of belonging now, a sense of home, because of the friends she has made. She doesn't stay with them -- she has to go off on her own to make money to pay down her debts -- but Hattie realizes that if you have people in your heart, if you have people who care about you, that it all that matters. I cried. I adored it. And that is why it's a book for grown ups. Because by traditional standards she has lost: she has no home, is in debt, is separated from friends and loved ones. Yet in her heart she has won. "Though I should feel a total failure, my time on the prairie has branded this hope on my hear: next year it will be better." And I think I love this book, and Hattie, and Kirby Larson, because that is my own hope. My interview with Kirby Larson at The Edge of the Forest. Bildungsroman / Little Willow review. Yay, Hattie! Such a well-told story. Laura Ingalls and Anne Shirley would approve. The only thing that makes me sad was that it didn't win the Newbery outright. You are NOT the last blogger to review it. It is in my TBR stack as we speak. Now, I really want to read it! You and Camille are NOT the last bloggers to review it! It is also in my summer TBR pile, and I promise to come back after I've read it and thoroughly read your review. Thanks for the notice of spoilers!